Snuff is powdered tobacco, usually blended with aromatic herbs or spices. The habit of snuff-taking spread to China from the West during the 17th century and became established in the 18th century. People generally carried snuff in a small bottle. 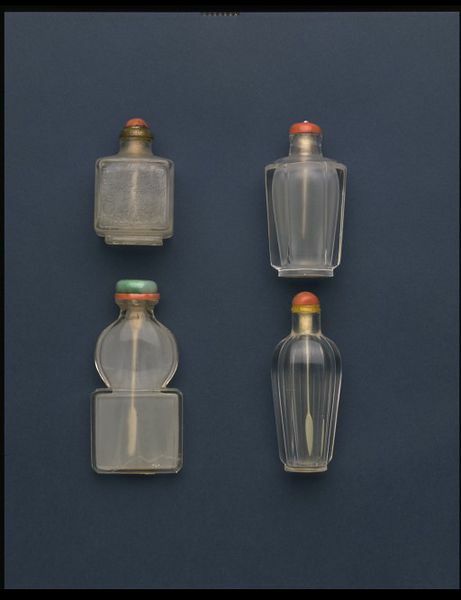 By the 20th century these bottles had become collectors' items, owing to the great variety of materials and decorative techniques used in their production. The bottle is an extremely flattened form of a rectangle surmounted by a circle, the shoulders sloping up to a flared neck. It has a two-part flat-topped stopper. The bottle is made of rock crystal, transparent, with the inside surface frosted white; the stopper of jadeite jade and coral. The flat bottom of rectangle forms the base of the bottle and there is no foot. 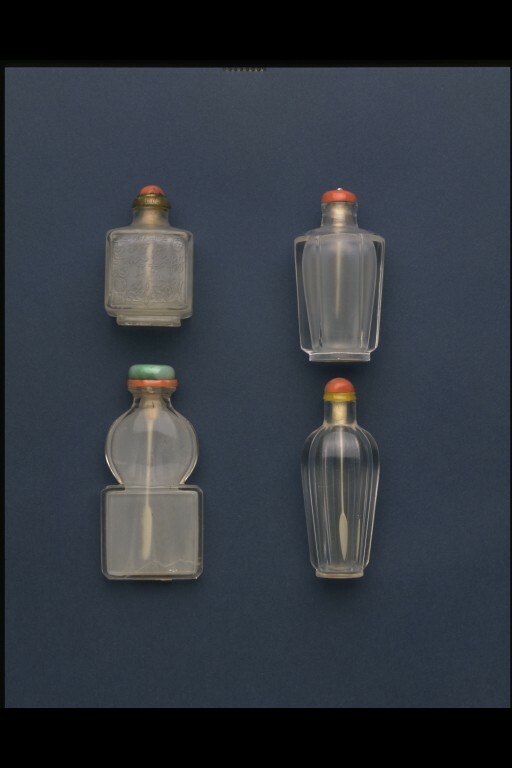 The decorative interest of the bottle lies in its unusual and very elegant shape, and in the purity of the colour; it stands only precariously. Chinese snuff bottle, rock crystal with jadeite jade and coral, Qing Dynasty; 1870-1895. White, Helen. 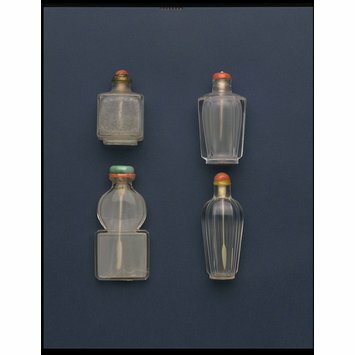 Snuff Bottles from China. London: Bamboo Publishing Ltd in association with the Victoria and Albert Museum, 1992. 291p., ill. ISBN 1870076109.